Published in the Dover Express, 5 December, 1980. For generating the direct current, used by the trams and other large power users, there were two machines of 100 kilowatts capacity. British-Thomson-Houston driven by McIntosh Seymour horizontal engines: one 225 kilowatt British-Thomson Houston, driven by a Ball and Wood horizontal engine, one 350 kilowatt British Westinghouse dynamo, driven by a vertical compound engine by Allen, Son and Co., Bedford; making a total direct current plant of 775 kilowatts, giving a grand total of 1850 kilowatts In the engine room. The auxiliary machinery consisted of four steam driven circulating pumps, installed during the later period of the company; two direct coupled tandem engines and exciters; and in connection with the accumulators, a booster machine for raising the voltage of the charging current, and a smaller machine, called a “ milker,“ for charging individual cells. The accumulator room, erected in 1898, contained a battery of 268 Tudor accumulators of 560 ampere hours capacity, enabling the day lighting to be economically supplied, while on Sundays it entirely took the place of steam power during daylight. The mains for the distribution of the electricity power supply in Dover are very extensive, and it was to cope with this wide area that the alternating high-tension system was first adopted; but a direct current supply was introduced for the trams, the harbour works and other large users of power. The extreme length of the main from end to end when this book was written was; high tension (feeders) 11 miles and low tension (distributors) 22 miles, making a total of 33 miles. All the main cables were carried under the pavement in cast-iron pipes, affording protection from accidental damage by opening the ground, and giving the facility for any particular length to be easily drawn out and repaired. The total amount of electricity generated at this station in the year ended March, 1905, was 1,334,000 Board of Trade units, and the accounts made up to that date showed that the revenue had been sufficient to meet all expenses, including interest and sinking fund, and to leave a credit balance of £1,475 to be carried forward. There were at that time 822 users of electric current for lighting; and for power there were 44 tramway motors and 56 private motors of half-horse power and upwards, as well as a large number of small fan motors. There were 152 public lights, being 64 arc and 88 incandescent lamps. The charge for light was sixpence per unit, less one penny discount for cash, and 2 id. per unit for power and heating. The capital expended on the works was £178,500 and number of persons employed 65. The works were then under the control of Mr L. W. Woodman, Borough Electrical Engineer. Dover Corporation’s electric tramway was opened in the year 1897, providing a cheap and speedy means of locomotion which the town, stretching between two and three miles up the Dour Valley, badly needed. Cautious town councillors were worried that the system might not be profitable in a town the size of Dover, but they were assured that with Dover homes clustered round a central valley two to three miles long, with heavy employment in the docks area and another well populated area off the Folkestone Road it was well suited to a tramway system. The plans were prepared by Mr Henry E. Stilgoe, the Borough Engineer. The Provisional Order authorising the construction of this line gave permission for a Municipal authority to work tramways, the method of traction being left to the option of the Town Council. The Corporation appointed Mr Stephen Sellon as Consulting Engineer and he reported on the possibility of both electrically driven trams and those powered by the Luhring Gas System which was being pressed for by the Dover gas undertaking. His recommendation was that electric trams be adopted and the Town Clerk, Sir Wollaston Knocker, and the Borough Engineer. Mr Stilgoe, who were deputed to make enquiries as to the various methods of traction available, backed this recommendation and the overhead wire system of providing power to the tram-cars was adopted. It was also decided, upon the advice of Mr Sellon, to enter into an agreement with the Dover Electricity Supply Company for obtaining the necessary electric current at sixpence per unit, subject to deduction as the consumption increased. Two books have been published which give lengthy accounts of the history of Dover’s tramway but both gloss over the great controversy which surrounded the proposal to bring in a Sunday service. There was a stream of letters to the press, a big public meeting in the town hall as well as a long series of open-air and other public meetings, and protests from the pulpit of practically all Dover’s churches. 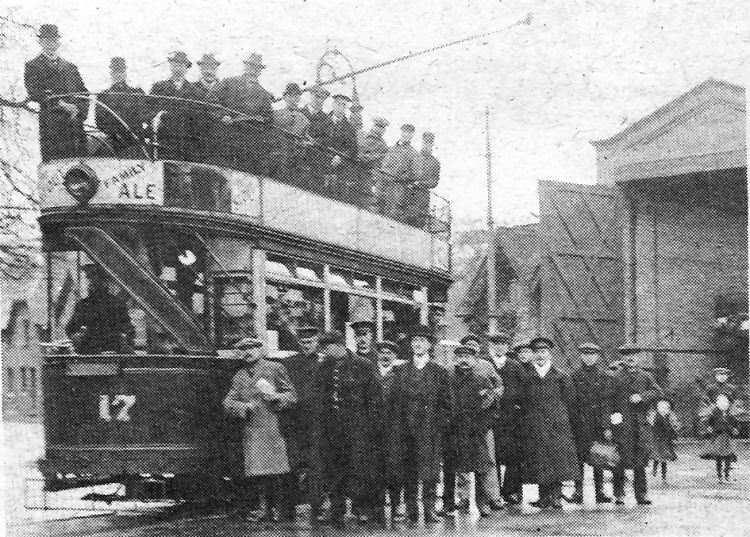 The Tramway Committee had proposed to do nothing about the agitation for Sunday trams but after an unofficial poll of the town early in 1911 the local council was forced to hold an official poll by ballot. This was held on March 18. nearly 5,000 people recording their votes — 84 more than at the previous year's Parliamentary election. The result was a majority of 1,164- in favour. 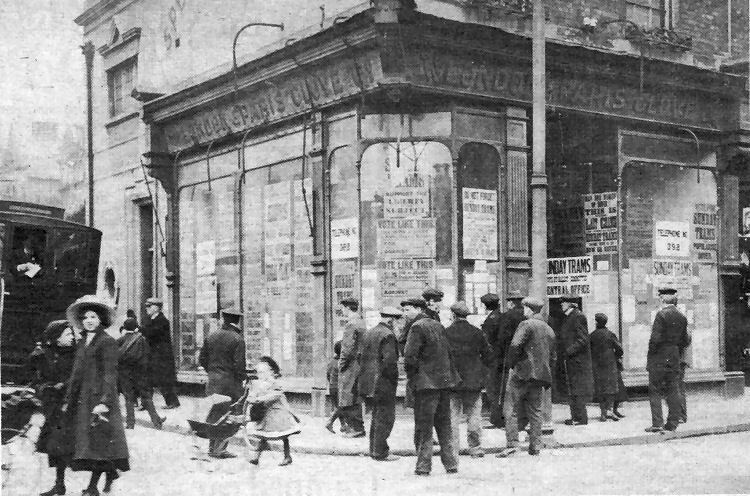 Pictured above is a shop opposite the town hall which became headquarters of the pro-Sunday trams group, and below is the first Sunday tram. 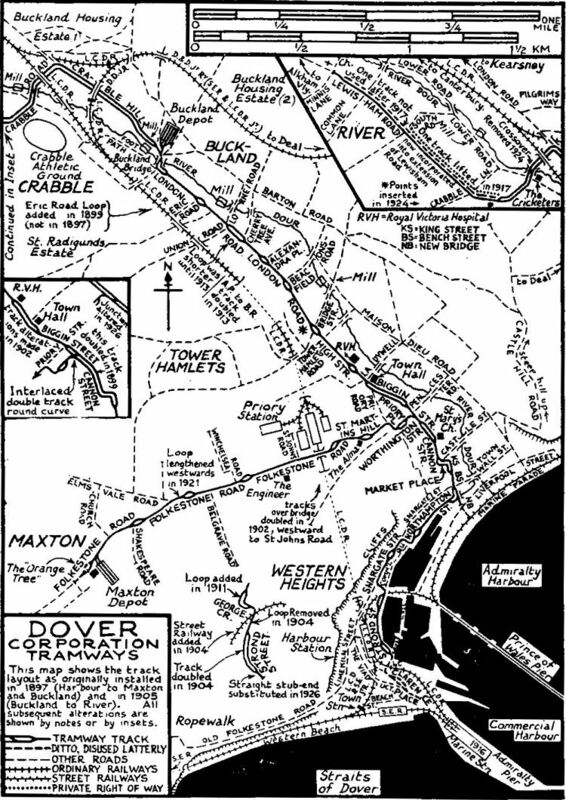 A map of the tramway system from J. V. Horn’s “ Dover Corporation Tramways“ published in 1955.